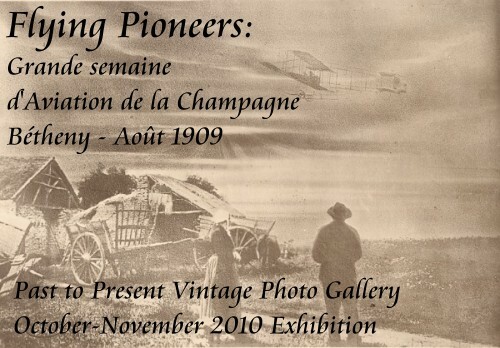 Our October 2010 exhibition showcases a large group of original photographs of the 1909 Reims meeting. This was the first international meeting in the history of aviation and was organized by Marquis de Polignac and the Aero Club de France. The first Gordon Bennett Cup for airplanes was also held at Betheny during this historical meeting. Out of about 100 "pilots" interested in taking part in the meeting, only 25 were actually able to register with a machine actually able to fly. Each pilot could present more than one airplane, so the total number of airplanes registered for the meeting was about 40. Most of the famous early pilots including Wright, Santos Dumont and Bleriot, are present although some had to withdraw before the meeting. This first international meeting was a success proving the reliability and speed of airplanes over balloons. The main winners were Curtiss who won the Gordon Bennett Cup, Latham who won the altitude competition and Farman who won the distance competition. The subjects we plan to showcase next are the French Second Empire and World War II Japanese propaganda photos.